, an architect very famous in France, particularly for his plan of the beautiful church of St. Genevieve at Paris, was born in 1713, at Trenci near Auxerre. His family was engaged in commerce, but he very early shewed a strong disposition for the arts, and particularly for architecture. 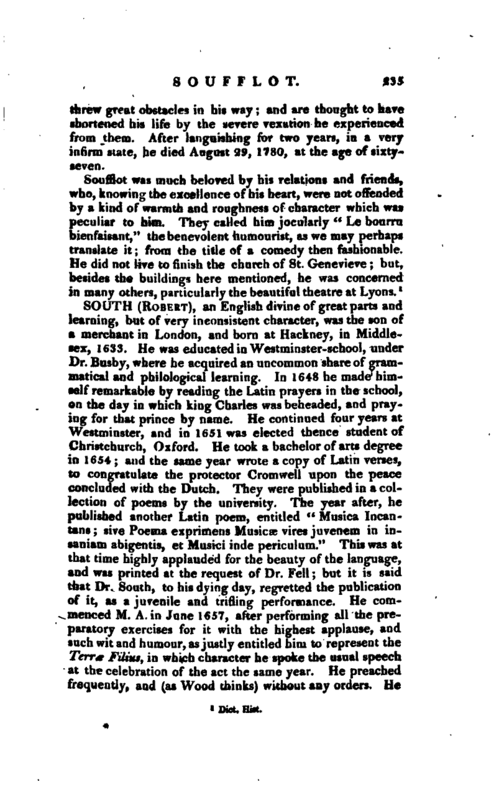 It is related of him, as of our countryman Smeaton, that, from his earliest childhood, he was more delighted by attending to workmen than any other amusement; and, like him, was so strongly directed by the bent of his genius to the profession in which he afterwards excelled, as to frustrate the wishes of his father to place him in his own business. The father of Soufflot, however, did not yield to his son’s inclination, and he was obliged to quit his home in order to indulge it. He immediately, with a small stock of money, set out for Italy, but paused at Lyons, where, by working under the artists of that place, he improved at once his knowledge and his finances. He then visited Rome and every part of Italy. Having improved himself under the best artists, and by modelling from the finest antiques, he returned to France, and for a time to Lyons, where he had made himself beloved in his former visit. He was soon employed by the magistrates of that city to build the exchange and the hospital, the latter of which edifices extended his reputation throughout France. Madame Pompadour heard of him, and having obtained for her brother the piace of director of the royal buildings, &c. engaged Sou/Hot and Cochin to attend him into Italy. 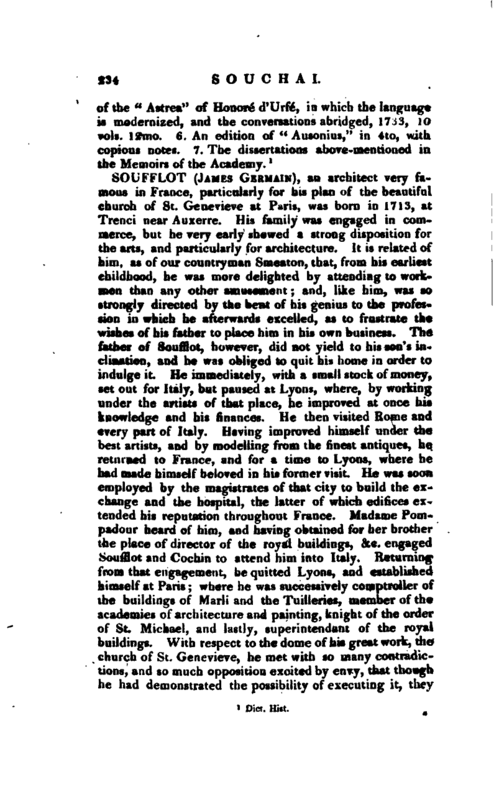 Returning from that engagement, he quitted Lyons, and established himself at Paris; where he was successively comptroller of the buildings of Marli and the Tuilleries, member of the academies of architecture and painting, knight of the order of St. Michael, and lastly, superintendant of the royal buildings. With respect to the dome of his great work, the church of St. Genevieve, he met with so many contradictions, and so much opposition excited by envy, that though be had demonstrated the possibility of executing it, they | threw great obstacles in his way and are thought to have shortened his life hy the severe vexation he experienced from them. After languishing for two years, in a very infirm state, he died August 29, 1780, at the age of sixtyseven.